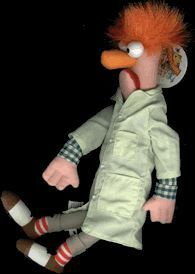 Earlier this month, the first commercially available doll of Muppet Beaker was released exclusively through the "Stage One" shop near Muppet Vision 3D at MGM Studies in Orlando, Florida. Fans have been desiring a Beaker doll for more than 20 years. The doll is available only at the "Stage One" shop in Florida, and will be manufactured in small numbers until 2001. This limited doll is the best addition yet to Disney's line of 14 inch Muppet plushes including: Kermit, Fozzie, Miss Piggy, Gonzo, and Animal. There are also new Disney exclusive dolls of Rizzo the Rat and the hecklers Statler & Waldorf. A representative from Disney confirmed that later this year there will also be Muppet Vision plush dolls featuring Scooter. A Scooter doll has not been released since 1978 by Fisher-Price.